Anyway, I run the tried and tested 33x10.5xr15 bfg km2s. They have given me a massive gain over my old 31" geolanders. I didn't go the wider and more common 12.5 wide tyre as, in my opinion, it puts a lot more stress on the driveline and cv's than what its worth. I haven't found a situation yet where the 10.5s were too narrow. 4. A wheel carrier. A 33" tyre will not fit under the truck in the original place Toyota designed. I built myself a swing away wheel carrier to solve this. You could put it on your roof but you'll use more fuel and raise your truck's centre of gravity. That's it! Some people go ball joint spacers but I haven't found the need to. No need for breaking out the grinder on your arches either! - The usual necessities: winch, snorkel, etc. 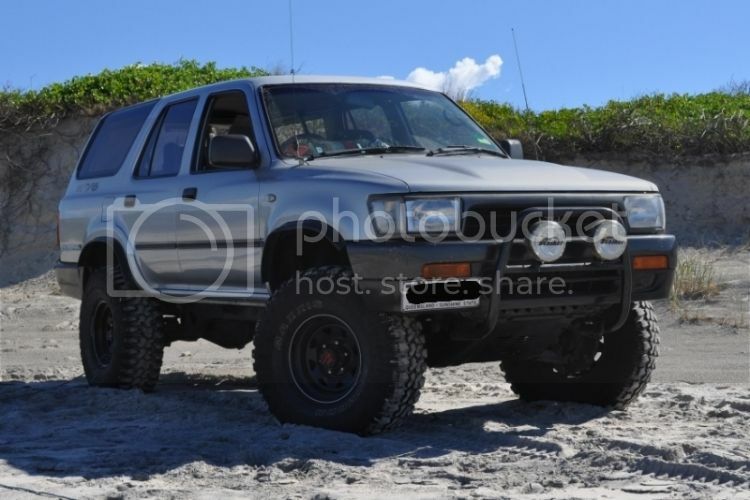 I had 33x12.5r15 maxxis bighorns on my old 4runner on 0 offset sunnys. It had 2inch springs in the rear and ball joint spacers in the front with torsion bars wound up to make 2 inch sus lift. 2 inch body blocks as well. Worked well, only slight rubbing on full lock full tuck up front but not enough to be worried about. -13's probably would have fixed it, but the 0 offset kept the 12.5's hanging out too far.